Ste. 403, City County Bldg., 400 Main St.
312 Rose L. Parks Ave.
Community Development Financial Institution (CDFI) providing business loans, technical assistance, mentoring for businesses in central and southern Appalachia and southeast U.S. Source: State and local organization websites. 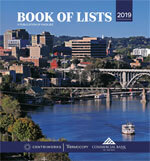 NA=not applicable or not available.This list and other Knoxville-area market data are available as Excel spreadsheets at www.knoxvillebookoflists.com. If you notice an error or omission, please contact Hayley Choy at 865-342-6494 or lists@knoxvillebiz.com.